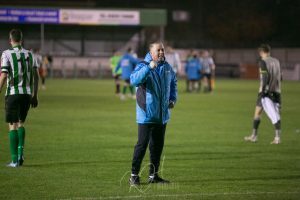 Alun Armstrong has challenged his Blyth Spartans players to maintain their winning mentality – and hopes the club’s three consecutive wins will entice fans back through the gates at Croft Park. Dan Maguire’s hat-trick and a record-breaking 198 goal from Robbie Dale – making him Blyth’s all-time second highest goal scorer – saw Spartans record a 4-1 victory against Marske United on Saturday. Blyth’s progression into the first round of the FA Trophy marked their third win in seven days following crucial back-to-back National League North victories over Curzon Ashton and Stockport County – opening up a six-point gap on the bottom three. “It’s been a tough week,” admitted Armstrong. “We knew this was a potential banana skin as Marske are a decent side, they play decent football and they are flying high in their league – so today was to make sure we were professional and done the job properly. “To be honest, I wasn’t overly happy with the first half performance. I don’t think we moved the ball anywhere near quick enough but we got ourselves in front. Following just two wins from their opening 10 fixtures, Spartans were dragged into the early relegation picture. However a return of one defeat in their previous seven matches has saw Armstrong’s men climb closer to the playoffs places – five points off 6th position. And as Armstrong targets looking up the National League North table rather than down, the former Ipswich Town striker has pleaded for fans to pack Croft Park – highlighting their importance to everyone at the football club. He said: “We knew these three games were massively important for not just the lads but for the club and fans as well. “We knew that with three wins on the bounce at home, we could hopefully bring the fans back that we’ve lost. “We need them, we need them massively. I don’t think they realise how important they are to this football club. “Without them, this football club would not survive and we need them more and more to come through the gates. “Hopefully this will give them a bit of boost and a reason to come to the games. “I said it was going to be extremely hard because we’ve brought in a lot of young lads to replace experienced players so you’ve got to bide your time with them. “I’ve always had faith in these lads and it was just about getting that confidence into them and never once did I lack belief in the players. “We had a tough start to the season, I think the first ten games are really tough but I knew once we started playing teams in and around us – we’d pick up points.